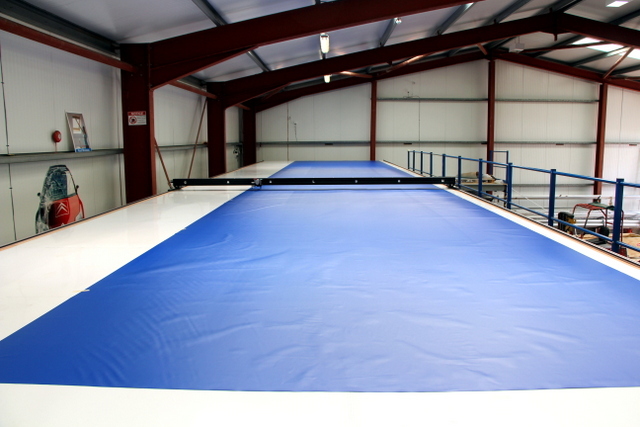 Ulster PVC, LTD, located in Norther Ireland, manufactures PVC fabric products to cover “just about anything that needs protection from the elements”. 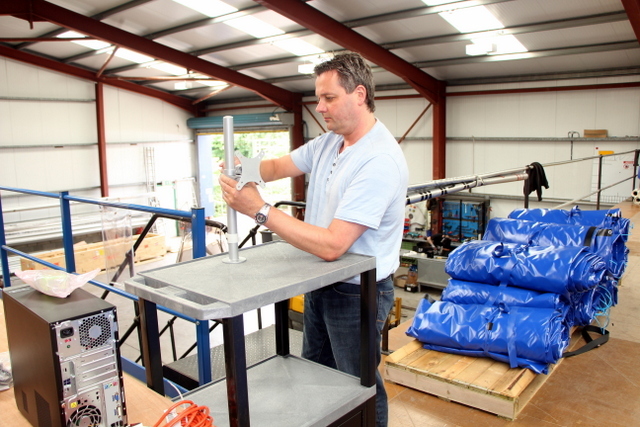 They have maintained a competitive edge by quickly delivering quality, custom products. To offer speed and quality at a reasonable price, they MUST use technology and automation. 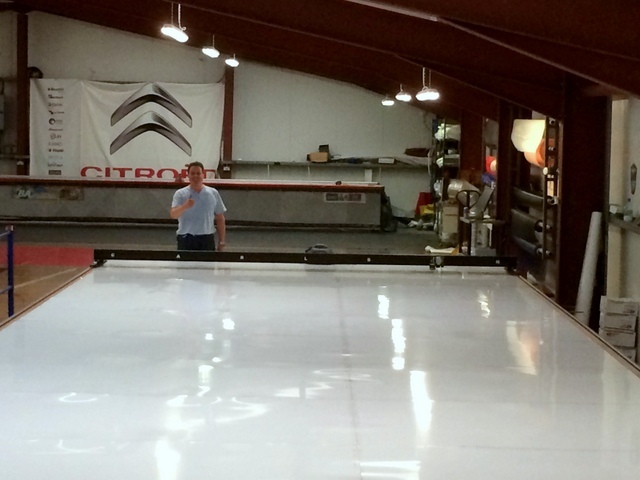 They purchased a Carlson Design WT-172″ Plotter/Cutter and mounted it on a home-built 172″x58′ long table. 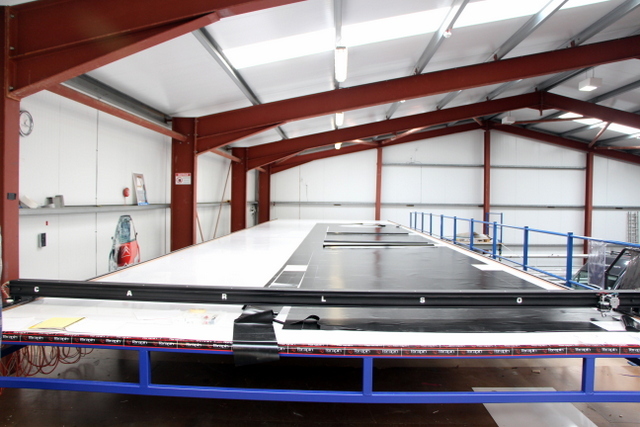 This is a HUGE setup, capable of marking and cutting up to 4m wide material. 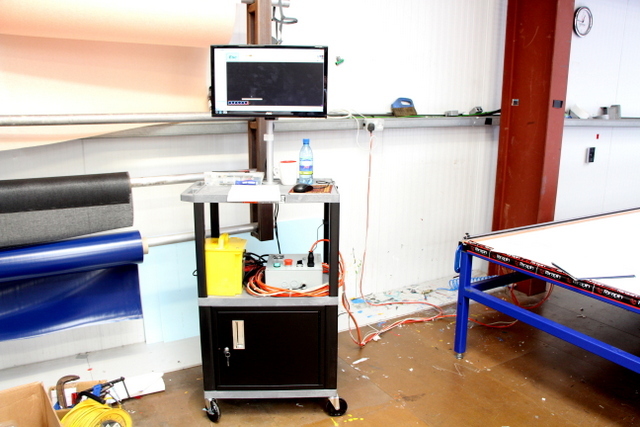 WT-172″ Plotter/Cutter on a 172″ wide x 58′ long home-built table. Our Carlson WT-172 replaces a fifteen year old plotter. 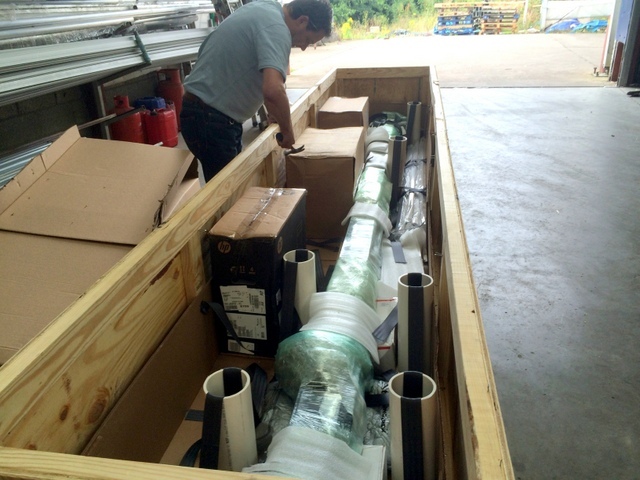 They were looking for “a new larger and more advanced system”, so after 3 years of calls, several trade shows, the construction of a mezzanine, and a visit to Tulsa, Oklahoma, Ulster PVC selected Carlson Design to build their new system. “We liked that we were dealing direct with the owners and not some sales guy that might disappear. After meeting you guys, we could tell it was going to be a good fit.” We agree! Thumbs UP from Ulster PVC! That’s more like it! 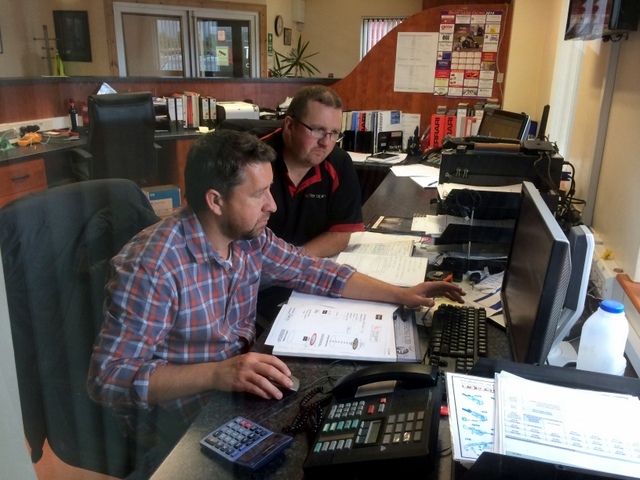 Ulster PVC has a lean, but dedicated team. Most of their guys having worked there for over a decade. Gary’s uncle started the business in 1969 – which means there is a lot of PVC cover experience under their roof! 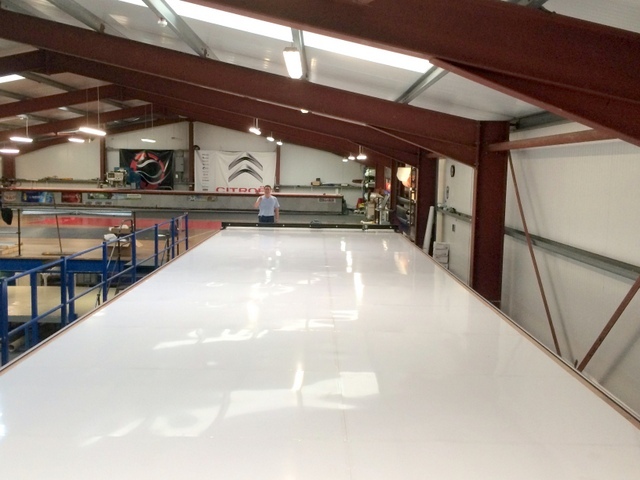 Cutting 3m wide 560g/m2 PVC. 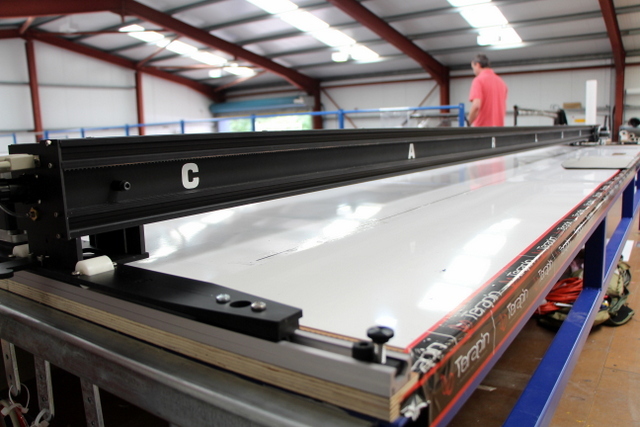 The WT-172″ Plotter/Cutter can plot/cut up to 4m wide material. 4″x4″ composite aluminum frame keeps the machine rigid at 172″ wide. 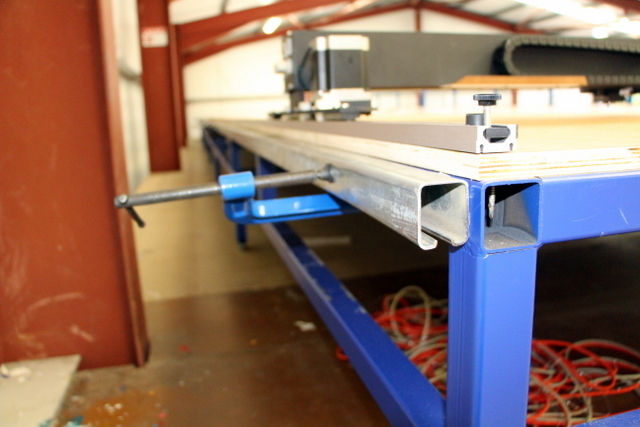 Stretched X drive plates keep it square on a 58′ long table. We find the most effective training is “real world” kind. 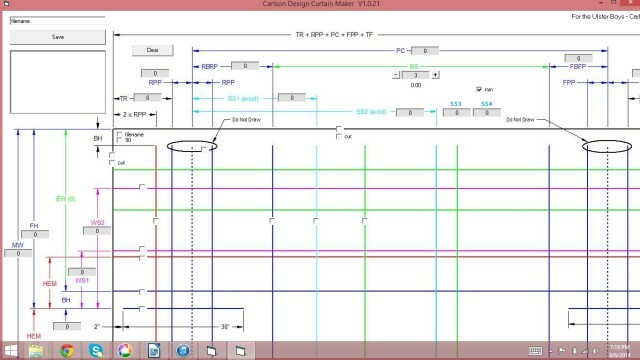 Once the system is calibrated it’s time to start designing real patterns for a real job. 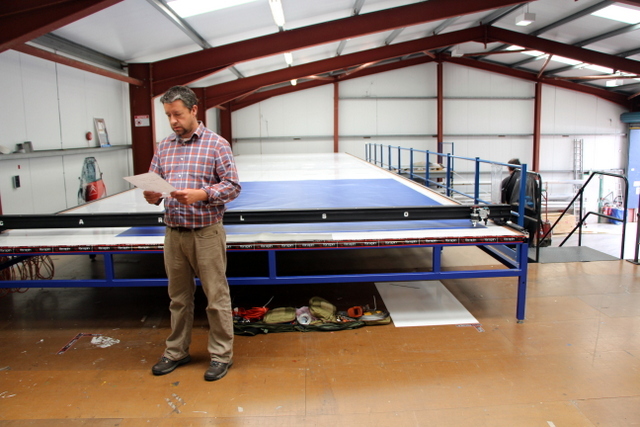 Our first job at Ulster PVC was for 24 round covers. Each cover consisted of a round top, base, two reinforcement patches, and seven reinforcement strips (11 parts in total). The simple shapes — circles and rectangles — were quickly drawn using the Carlson Design Plugin for Sketchup – a free and easy to use CAD program. The custom patches were designed using “keyboard” Digitizing. 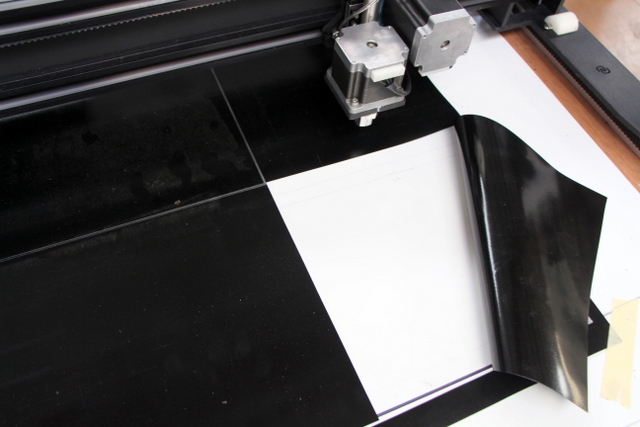 KEYBOARD DIGITIZING – A Carlson advantage: Turn any plotter/cutter into a pattern digitizer. Simply jog the machine using the keyboard’s arrow keys and position the pen over a desired location, and record a point. Jog the machine to your next point. Pro Tip: use a laser pointer in your pen holder for easy sighting. Jog the pen holder to significant points on the pattern and click the record button on your wireless keyboard. The main advantage of KeyBoard Digitizing is it gives you a digitizing bed the size of your plot/cut table. 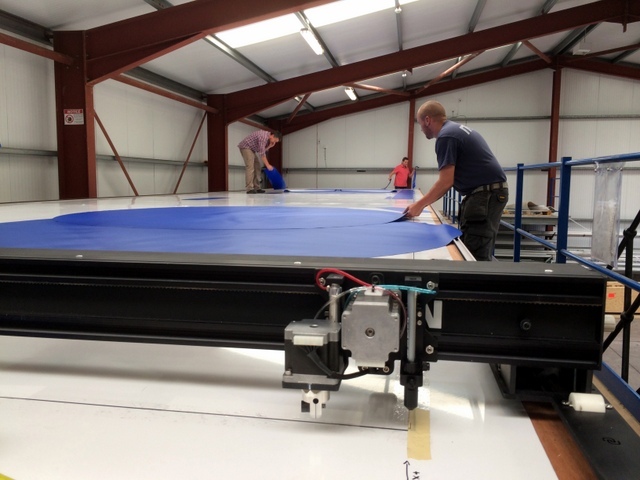 This means Ulster PVC can digitize up to 4m wide x 17m long patterns! If you have a lot of physical patterns to digitize, the Carlson Design T-Bar Digitizer is a much easier and faster solution. The T-bar allows you to trace a pattern as quickly as you can move your hand around it. Once the patterns are designed, they are manually nested in Plotmaster. They store material rolls downstairs and uses a roller/slitter to spool off enough material for each job. Pull fabric. 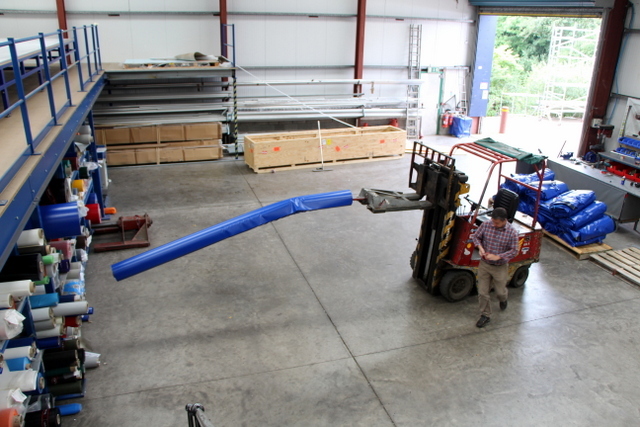 They use a roller/slitter located downstairs to spool out the desired length of material before taking it upstairs. Spread enough material for the first cut. Gary confirms the parts in the order before cutting. First cut! 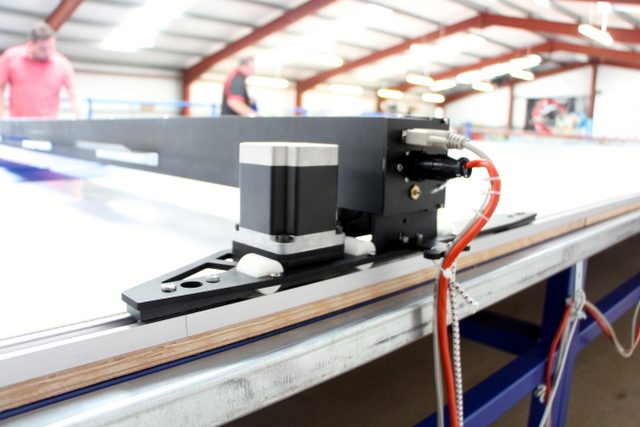 We are cutting 560g/m2 PVC with a 28mm steel rolling blade. Marking with a pen or Sharpy. Ian checking parts. Note: Nesting parts maximizes material yield. 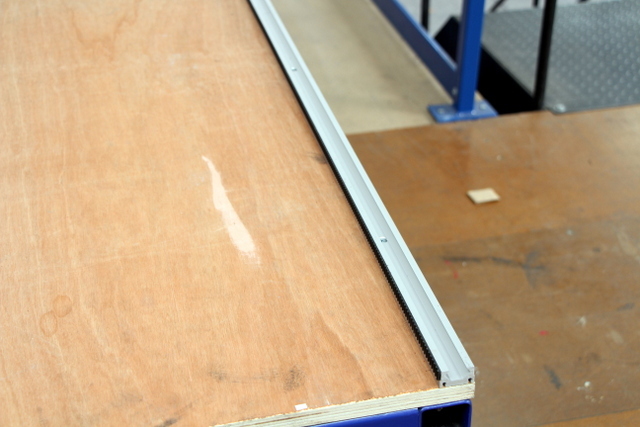 Ulster PVC did not build a vacuum table — they are using the weight of the material to prevent it from shifting during the cutting process. A 1/2″ seam allowance means they do not have to worry about a little shift here-and-there. 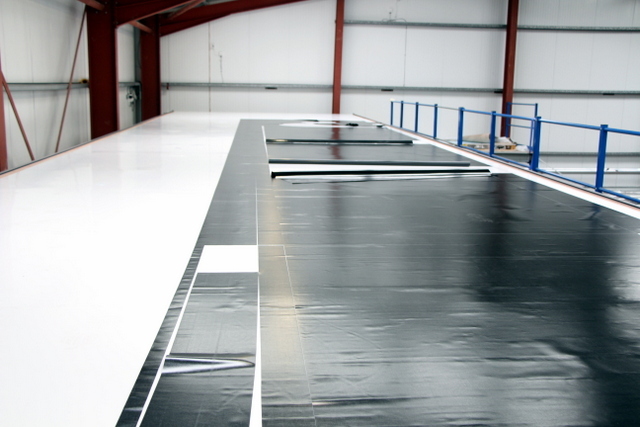 For fine detail projects they can use a low-tack, repositionable adhesive spray to prevent material shift. The total time to mark and cut these parts was less than 12 minutes. This would have taken a couple of hours by hand. WATCH ULSTER PVC’s FIRST PLOT/CUT HERE! Let’s plot/cut a full table! 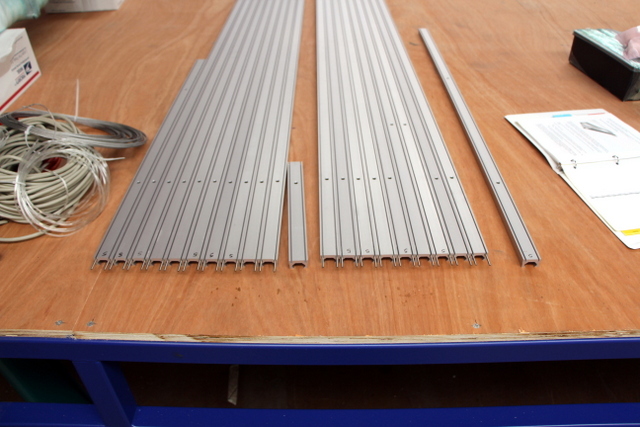 With the success of our first cut, we nest all of the parts for the 24 covers in this job (264 pieces in total). Using our Autonesting software, we were able to nest 264 pieces in 36 seconds! This reduced material waste by three meters. 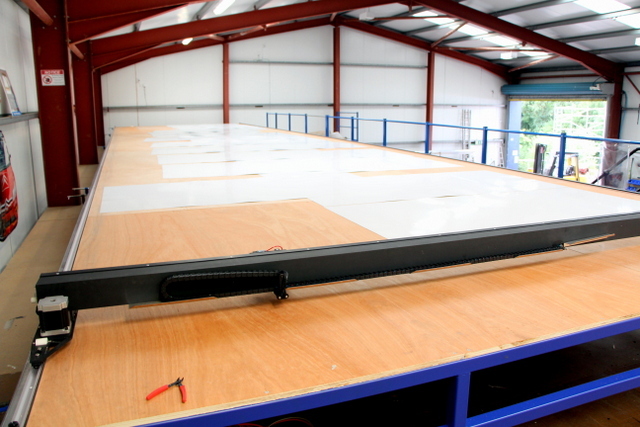 The total job was nested across 92 meters of material, which meant they would need to run six full tables. It took 20 minutes to plot/cut each table and 2-3 hours to complete the entire job start-to-finish. By hand, they estimated this job would have taken 2-3 days! If this project gets ordered again, anyone in the shop can pull material, select this nest (or re-run the autonesting), and hit “GO”. Stacking perfect 2.5m wide circles. Ulster PVC’s primary product line is curtain wall tarps for large trucks. Each curtain wall is custom, but shares many components with other curtain walls. 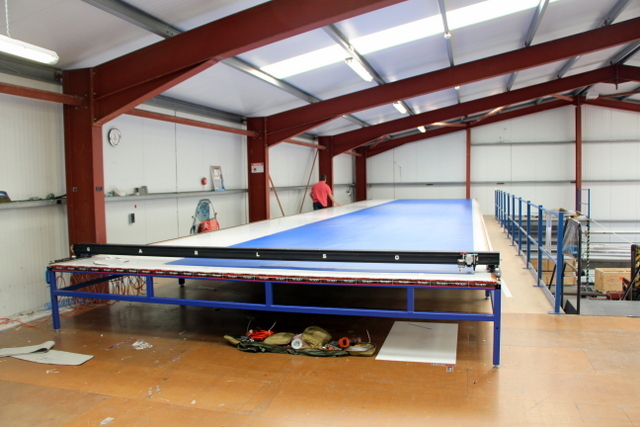 We designed a custom curtain wall designer called “Eurotarp” to help Ulster PVC quickly produce their custom patterns. 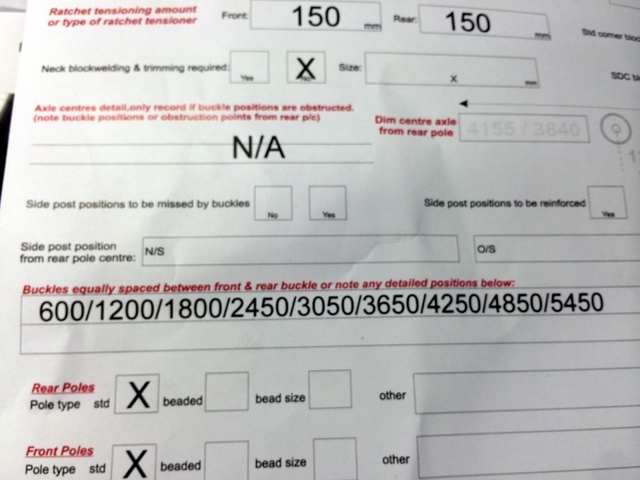 Order form has input fields for most curtain wall variables. 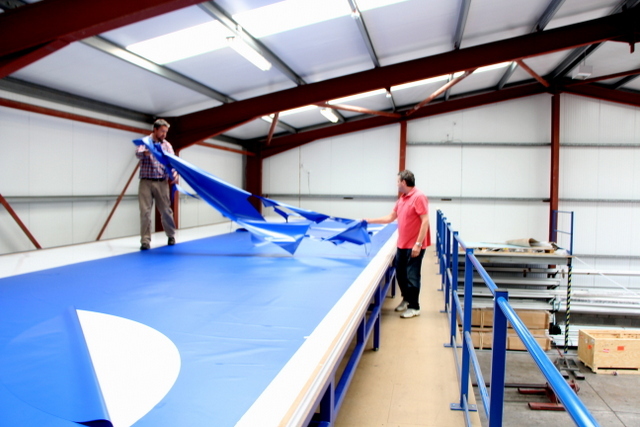 Eurotarp is a custom program to address their bread-and-butter repetitious jobs. Some of their curtain walls have too many custom variables or deviate from the standard design enough that they cannot be rendered in our program. These exceptions are roughly designed Eurotarp and then imported into Sketchup for further modification. The guys are able design their plot/cut files in Sketchup and Eurotarp from the comfort of the front office. They can share these ready-to-cut files over the network to their plotter/cutter computer. Design patterns downstairs. Gary is designing and training at his desk. Using networked computers, ready-to-cut files are remotely placed on the plotter/cutter’s computer. File naming and organization is important. Ready-to-cut jobs are placed in a “Jobs” folder. This way, anyone in the shop can run the plotter/cutter. Sketchup is a great tool for designing basic parts, as well as editing or modifying custom parts. This four piece job was entirely drawn in Sketchup, manually nested in Plotmaster, and then plot/cut in less than 30 minutes. The results are next to zero material waste and very little skilled labor required. Manually nested parts are optimized in PEdit. Optimization combines common cut lines, decreasing cut time and lowering the chance for material shift. A silver Sharpy is a great way to clearly mark dark materials. 28mm rotary blades are perfect for cutting 900g/m2 PVC. This job was designed, nested, and cut in under 30 minutes. It has minimal waste and minimal skill/labor invested. 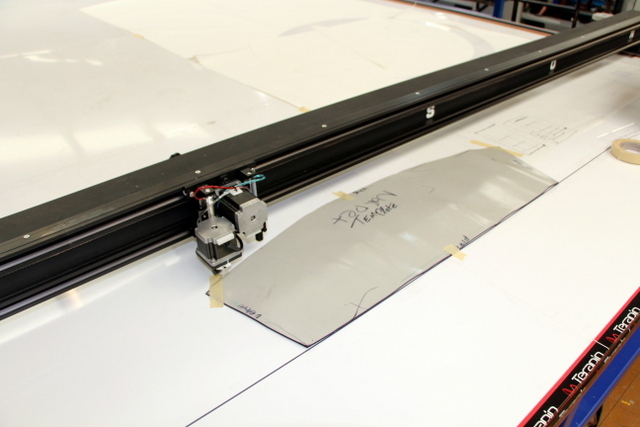 Video: Cutting strips with a marked seamline. Three different widths. 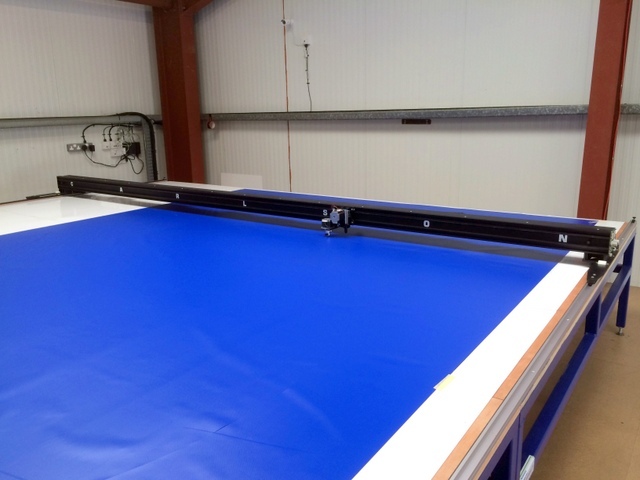 Video: Cutting a single cover out of 900g/m2 PVC. In this second project, they did not have enough cutting pressure on the blade to complete the cut. The plotter/cutter is VERY repeatable, so they simply increased the pressure and ran the cut a second time. This pattern would be relatively simple to cut by hand, however using the plotter/cutter means they have a record of exactly what was cut. This accountability is really helpful when you’re shipping covers around the world. 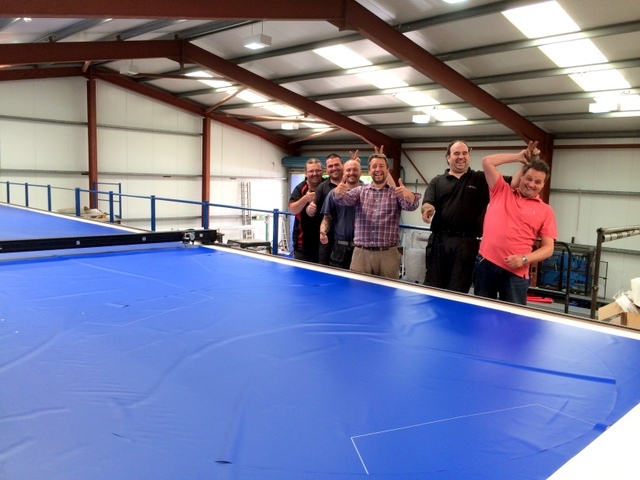 We were able to install their plotter/cutter in a single day and spend the next 2-3 days training. This would not have been possible without the help of the Ulster PVC team and Gary and Ian’s preparation. 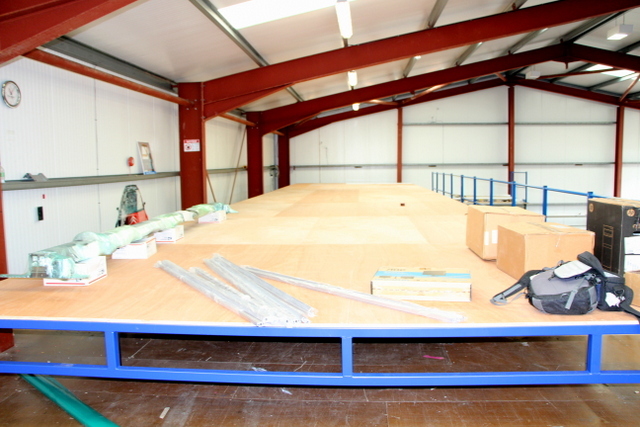 Before we arrived, they had their table built, work area clear, and an electrician on-call. 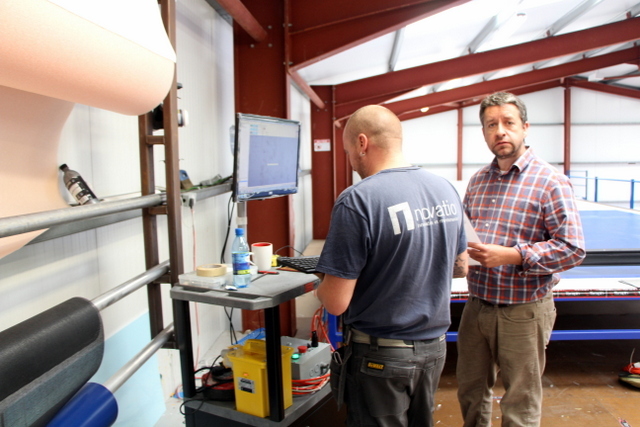 Ian worked with us throughout the install, helping his understanding of the equipment AND helping us get setup that-much-faster. 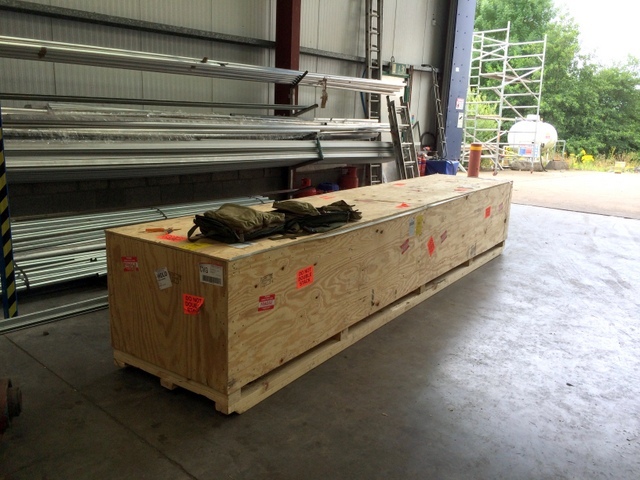 Custom crate ensures everything arrives in one piece. They built their own table, which means we only shipped: Plotter/Cutter, track, cabling, computer, workstation, and accessories. Inspect the shipment for damage as soon as it arrives. We carried everything from the loading dock, upstairs to the Mezzanine. 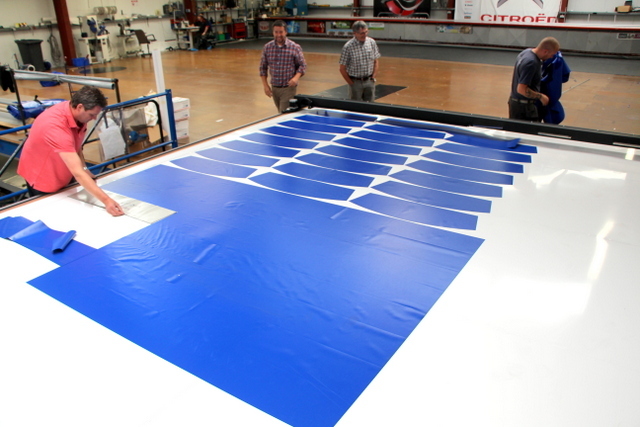 Individually, nothing in the Carlson plotter/cutter system weighs too much for one or two people to hand carry. Learning your system — Ian had a hand in every part of their install. This way he knows the system inside-and-out. It also meant we started training that much earlier! Organize track sides A and B. 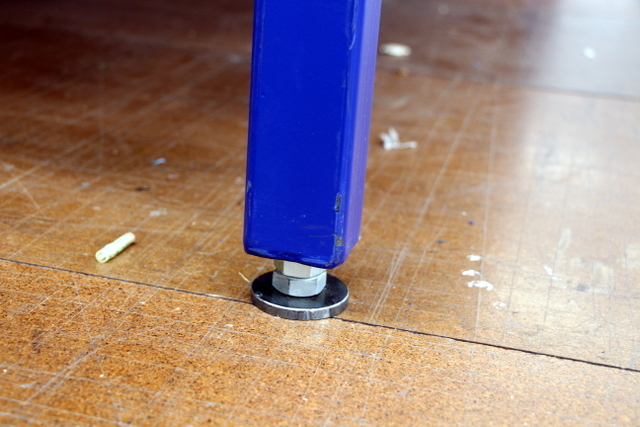 Set connecting pins with Loctite FIRST — this gives them a chance to set while leveling the table. Level the table. They built their own table and leveled it after construction. Now that it’s had time to settle, we will re-level. When building your own table, it’s a good idea to make it easy to adjust/ level. A level table is a fast table. Great work guys! Install track side A as straight as possible. Mark and drill pilot holes — hand screw screws to prevent over tightening. Set side B. 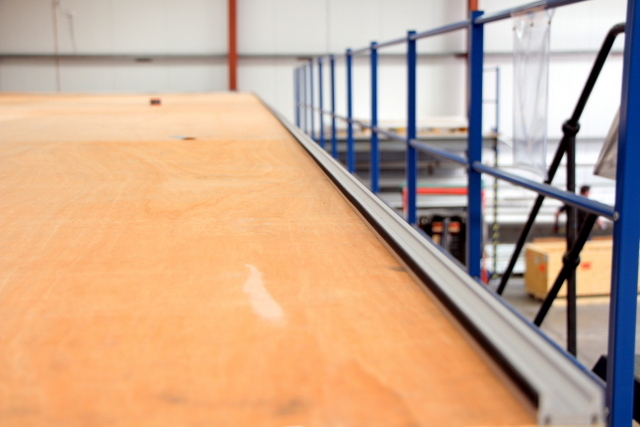 The gantry will serve as a jig to square side B to side A. Gently place on track. Push, Pilot, Screw. 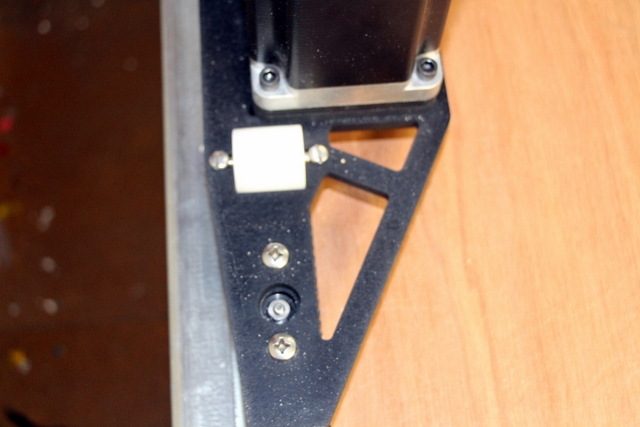 Adjust load wheels and track trolleys. Attach track belt. Put double sided tape on track. Thoroughly rub belt with acetone. Apply both sides with even pressure. They provided their own custom side-mount cable management solution. This is secured to the table with an adhesive caulk. Use enough slides to keep the cable off the floor. A Bungee Cord from the first slide to the cutter will prevent putting undo stress on the control and power cable. 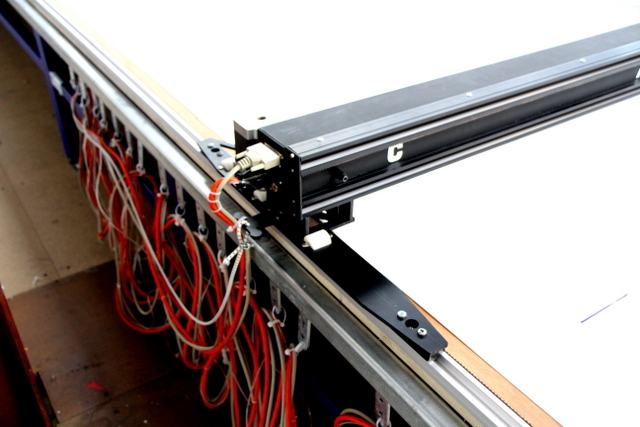 The Plotter/Cutter is driven by three cables: air, power, and control. 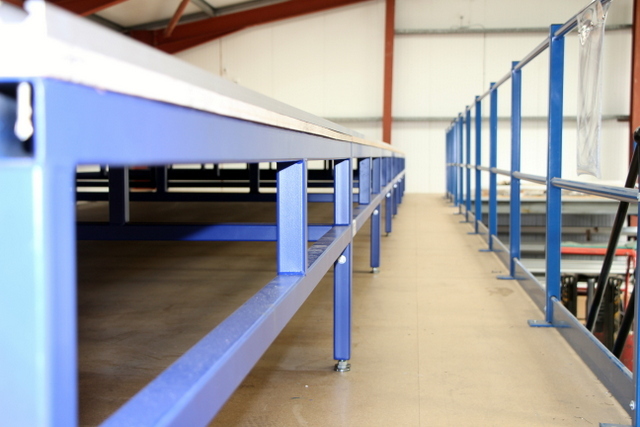 The Carlson Operator’s Workstation includes a locking, rolling cart and monitor. A wireless keyboard gives the operator a wide range of mobility (up to 100′). 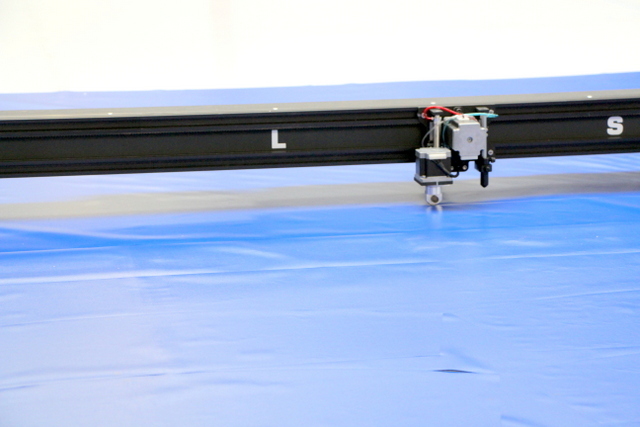 End of day 1 – note the Plotter/Cutter’s orientation. The start location should be opposite the side you plan to load and unload material. Once we established this end, we rotated the Plotter/Cutter 180. The new orientation is also much more impressive to guests walking up the stairs! All done! That’s a good looking setup. 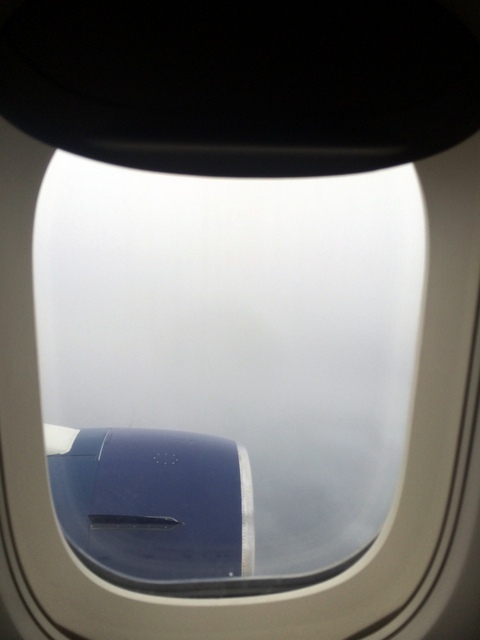 Landing on a typical Irish day. This is why they need to make quality PVC covers! The sun did eventually make an appearance! 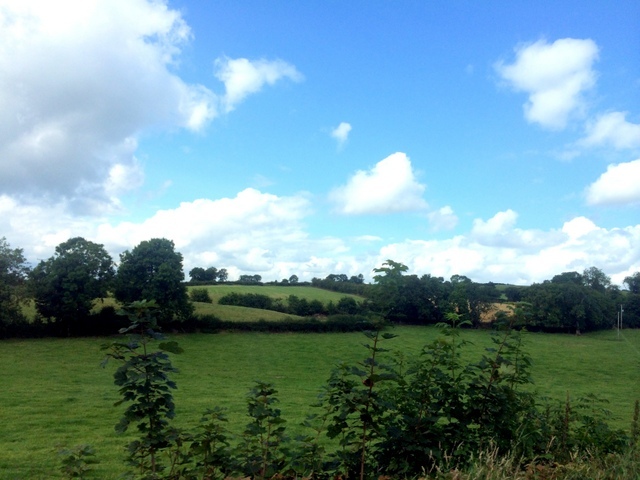 Keep Ireland green — this bucolic country side is second to none. 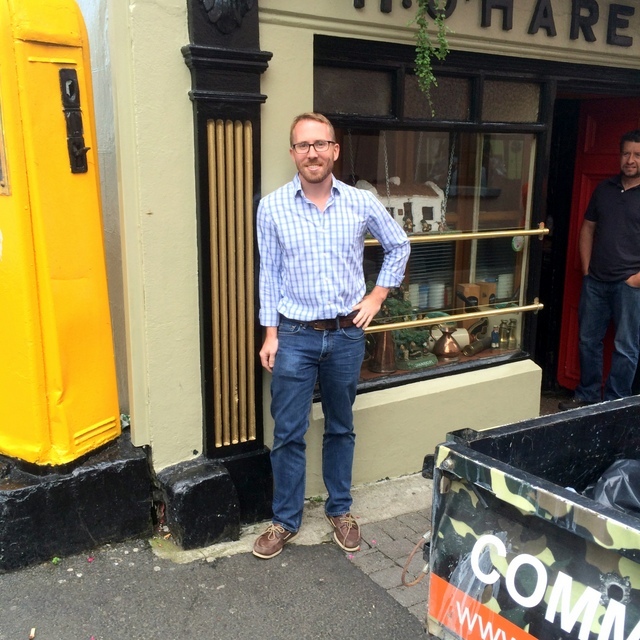 Tom get’s a tour of a Ireland. 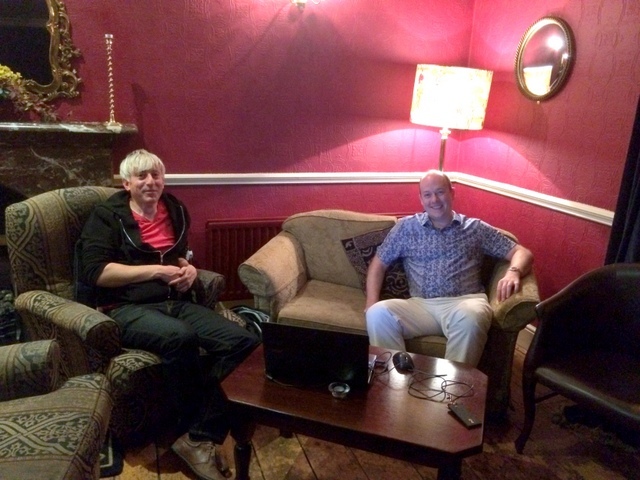 We ran into Rob and Glenn — the designers of our fantastic autonesting software. Job well done! 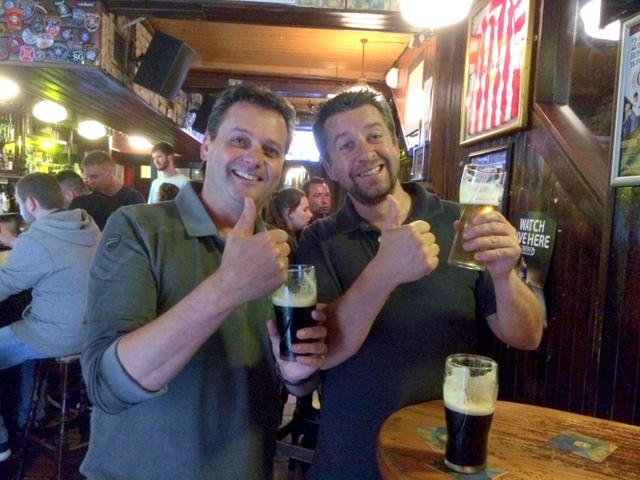 Ian and Gary give a BIG thumbs up in Dublin. Celebrating a job well done. We’d like to give a big thanks to Ian, Gary, Mike, and the rest of the Ulster PVC team for their help in a fantastic setup. We couldn’t have picked two better guys to work with — we look forward to seeing some great projects cut on your Plotter/Cutter!